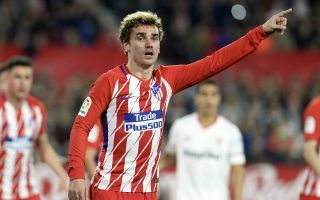 Antoine Griezmann put on a real show for any potential transfer suitors this summer as he contributed four goals for Atletico Madrid in their 5-2 win at Sevilla. The France international was in stunning form to score a hat-trick and pick up a superb back-heeled assist for Koke as Diego Simeone’s men ran riot in a hugely convincing away win. Don Balon have recently claimed Griezmann is keen on a transfer to Barcelona, while Diario Gol recently reported that Manchester United remain interested after strong links around a year ago. With United only managing a 0-0 draw at Sevilla last week, Griezmann showed the Red Devils what they’re missing with his immense goal threat, with the first of his three last night a real stunner with his weaker right foot. The 26-year-old is undoubtedly one of the finest goalscorers in Europe when he’s in this kind of form, with his highlights available in the video blow. United may have earned a morale-boosting win over Chelsea this weekend, but could still do with someone like Griezmann to add more quality to an attack that has had its difficulties this term. Romelu Lukaku has been inconsistent since his summer move from Everton, while Alexis Sanchez is yet to get going since his January switch from Arsenal. Griezmann could also prove an upgrade on the likes of Anthony Martial and Marcus Rashford in the wide areas, and seems the kind of calibre of player the club should be chasing if they are to move forward. The former Real Sociedad man showed a bit of everything in the win over Sevilla, with quick feet and a ferocious shot helping him net his first, and coolness and composure inside the box key to his other two, plus intelligence and awareness to brilliantly set up Koke for his goal. Elite clubs will no doubt be taking notice once again after Griezmann’s one-man show here.